This Stage 2 cold air intake produced an astounding 36hp and 63lbs. x ft. torque and outflows the factory intake by 33%! Enclosed in a durable, one-piece 16 gauge, powder-coated heat shield; this air intake system features a huge washable/reusable inverted cone conical air filter with Pro5R oiled media for maximum air flow. 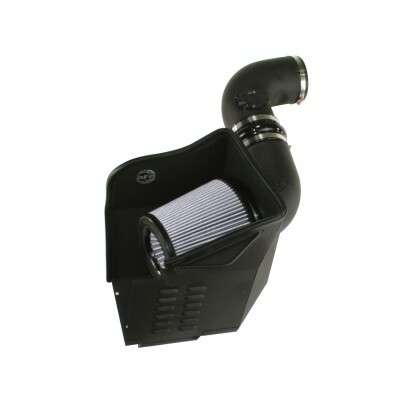 This intake system also features heat-insulating molded plastic tubes with a 3-angle adapter that replaces the stock intake tract and directs increased air flow with improved volumetric efficiency for maximum performance. The one-piece heat shield features two built-in grille side fresh air scoops and two rows of louvers that bring in additional outside air for a cooler, denser air intake charge. This heat-shield requires little or no assembly and utilizes factory mounting points for easy, no-cutting or drilling installation. The filter is constructed with 100% polyurethane for long life and multiple cleaning cycles.